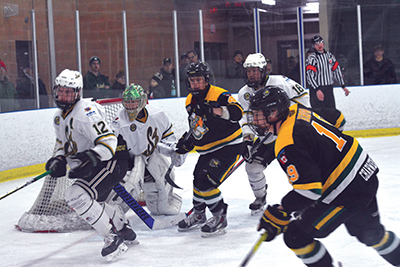 The Stayner Siskins are again the Carruthers Division champions after taking a 2-1 overtime win over the Alliston Hornets on Hornets home ice on Friday, February 1. The game was an epic battle as the teams arrived on the ice separated by a single point. If the Hornets could win they would take over first place to end the regular season. Stayner opened the scoring just 55 seconds into the first period. Alliston matched it at 12:33 into the frame, but that was all the scoring done in the regulation periods as two hot goal tenders and a lot of good defensive work by both teams saw them step up to playoff mode style hockey for this final match up between the first and second place teams. When the buzzer sounded to end the third period the teams were tied at one to force a three-on-three overtime period. With time running out and a minute left on the clock the Hornets put an extra attacker on the ice in a bid to get the edge and score the winning goal. It was all over when a Stayner player got a hold of the puck and took a shot on the empty Alliston net from centre ice to take the 2 – 1 win. The final game of the regular season was played out on Sunday, February 3, with Stayner winning 6 - 4 over the Orillia Terriers. The Siskins will be up against the Schomberg Cougars in the first round of the playoffs. The Hornets will take on the Huntsville Otters in their quarter-final series.